Some 35 000 Black South Africans had already served as part of a labour contingent in the South West African campaign as drivers and general labourers. A further 18,000 had served in the East African Campaign. The idea that Africans were to be sent to Europe met with strong opposition from the White establishment in South Africa. It was feared that if Africans would be exposed to uninhibited contact with Europeans on an equal footing, it would undermine the existing race relations in South Africa. There were also concerns that Africans would be allowed to consort with European women, and as a consequence develop ideas about equality with whites. John X Merriman, a prominent Cape liberal, noted that many (including himself), “regard the introduction of our Natives to the social conditions of Europe with the greatest alarm” (Willan:1978:64). It was further stipulated that every effort should be made “to prevent all familiarity between Europeans and Natives” (ibid). European and only White South African officers would be in charge of the contingent. Since the British government would bear the cost the formation of the contingent, Botha did not need the approval of the South African parliament. A recruitment campaign began in September 1916, in which the government enlisted the support of magistrates, chiefs, native commissioners, churches and leaders of South African National Native Congress (SANNC). Response to the recruitment drive was poor, and in some cases coercive methods were also used by chiefs to ensure enlistment. Many employers in South Africa, such as the Chamber of Mines and South African farmers feared that their labour supply would be threatened by the recruitment drive and actively discouraged enlistment. We believe that the discharge of ”¦ a cargo of grain in sacks at such a pace”¦nearly 170 tons per hour s an absolutely unique achievement”¦ we were ourselves utterly astonished at the results(Grundlingh: 98). Those in charge of the SANLC units believed that the exceptional performance was due to the strict disciplinary regime that the African labourers were kept under. In particular it was the provision that only South African officers, who are acquainted with the conditions under which the ‘native’ laboured in South Africa. It was believed that the labour output was considerably lower when members of the contingent were supervised by non-South African officers. Furthermore steps were taken to prevent SANLC members from working alongside European workers as it was believed these men were of a lower physique and could not match the output of SANLC units. This would encourage African to slacken their pace of work. (Grundlingh :100). A number of measures were taken to ensure that the consciousness of Africans serving in the SANLC remained tied to their inferior status in South African society. Particular care was taken in the selection of White officers who were to be in charge of the companies of the SANLC. A large proportion of them were chosen from the ranks of mine compound managers and officials from the Department of Native Affairs. These men, it was believed are best acquainted with native labour in South Africa, as well as native customs and culture. They were more likely to be vigilant of any social contamination that would result if the native come into close contact with Europeans, especially European women. These conditions proved in many instances not only impossible to adhere to in the immediate theatre of battle, but also served as a source of great discontent amongst SANLC members. 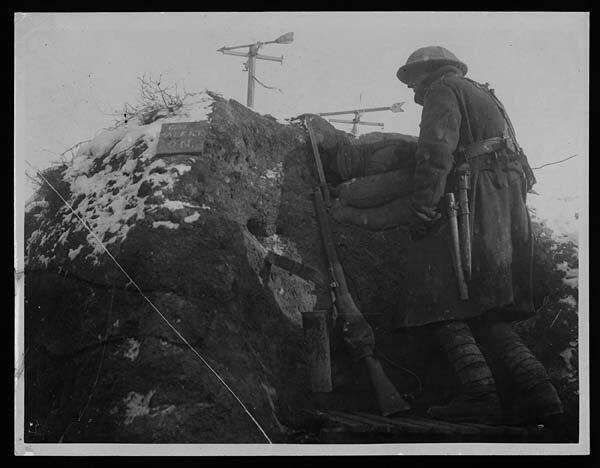 As trench warfare on the Western Front intensified, it became necessary to depart from the strict regulations governing the contingent. Officers in charge of the SANLC units were often transferred to fighting units of the British army at the front and replaced by British soldiers who were not fit for battle, as well as South African officers who had very little experience in dealing with ‘native labour’. According to Willan, from December 1916, a unified Directorate of Labour was formed by the British army to ensure a more efficient distribution of labour units. This resulted in reducing the control that South African officers had over SANLC units. It also meant that some units of SANLC were used in the battlefront areas where they had more freedom of movement and contact with members of other labour units. The needs of military considerations and where labour was needed determined where the SANLC units were deployed, which meant it was not always possible to house them under the conditions demanded by the South African high command in charge of SANLC. 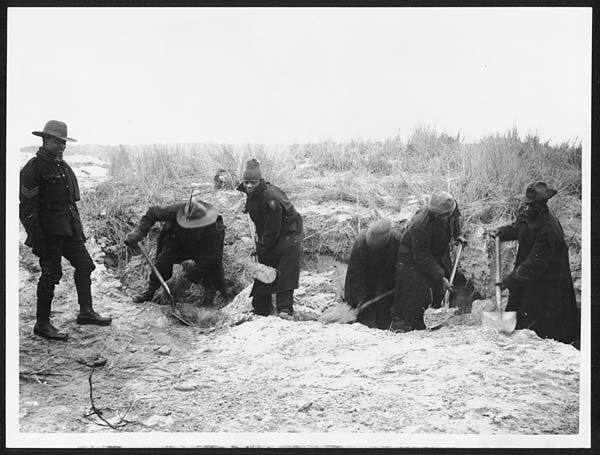 In the forward areas it was often necessary to mix members of the SANLC units with men from other units. Colonel S.M. Pritchard, commanding officer of SANLC, insisted on their withdrawal from the front areas for reasons that considered the political ramifications “if South African natives were reported to be near the fighting”(Willan :73). The British military command expressed extreme frustration at the insistence of the South Africans in charge of the SANLC to maintain the strict segregation conditions as it rendered the units virtually immobile. The SANLC units allocated to the French ports of Le Havre, Rouen, Dieppe, Rouxesnil, Saigneville and Dannes presented their own problems. They were all heavily populated urban areas and the ‘danger’ of ‘natives’ making contact with the local French population presented themselves. In Rouen a further problem was that a Battalion of the Cape Coloured Corps was stationed. There was anxiety about the possible impact on men from SANLC if they came into contact with fellow non-white South Africans, who not only had freedom of movement, but were also armed and treated as soldiers. Incidents like these made those in charge of the contingent realise that the closed compound system would have to be abandoned if the SANLC were to remain in France. According to Grundlingh resistance and discontent over the compound system increased in intensity as the men realised that they were the only labour contingent who had no freedom of movement. Even the Cape Coloured Corps, also from South Africa, were not only allowed to bear arms, but were treated equally to other soldiers on the front. 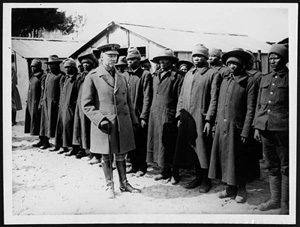 Lt.-Col Godley expressed the view in a letter that it became increasingly risky and hence ‘impossible’ to adhere to the rigid regulations set down by the South African government regarding the compound system, and “that it is unfair to ask, or even allow men to bind themselves down indefinitely under conditions which are unique, as all other units in France, both white and black are free to move about” (Grundlingh: 1987:114). The South African government, rather than considering abandoning the compound system, decided to disband the contingent in January 1918. • Grundlingh, Albert,(1987). Fighting Their Own War: South African Blacks and the First World War . Ravan Press: Johannesburg. • B. P. Willan, B.P.,(1978). ‘The South African Native Labour Contingent, 1916-1918’ in The Journal of African History, Vol. 19, No. 1, World War I and Africa (1978), pp.61-86.